This week for Thursday Travels, we'll be recounting our Swiss adventures, which took place in the Lake Lucerne region. None of us had been to Switzerland before, but we had a clear preconception of the place, imagining it to be clean and efficient with an abundance of chocolate, cheese and fresh air. And, as it turned out, we weren't too far off the mark - all the Swiss stereotypes are kinda true. We started off in Lucerne (or Luzern, its German spelling), spending a few hours in this serene, lakeside city with a population just under 80, 000. It's a very pretty place, with an interesting mix of architecture; modern(ish) steel buildings alongside the traditional wooden chalet-style structures. We checked out the city's two best-known landmarks, the Chapel Bridge and the Lion Monument, and stocked up on our Milka and Lindt chocolate (as was to be expected, the selection of chocolate bars was amazing). The Chapel Bridge, constructed in the 14th century, is the largest of the numerous bridges in Lucerne, and definitely the most ornate, with beautiful interior paintings. The Lion Monument (created in 1820-21), is a tribute to the Swiss mercenaries killed during the French Revolution. It's in a secluded little part of the city, shaded by trees and overlooking a glassy pond; a poignant sculpture described by Mark Twain as "the most mournful and moving piece of stone in the world." 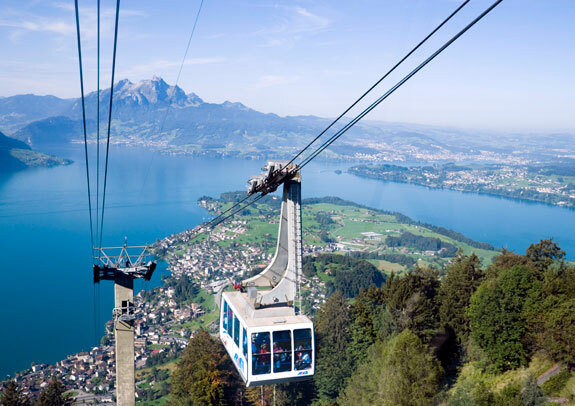 We were staying in a family-run chalet up Mount Rigi, about an hour from Lucerne, and midway between the summit of the mountain and Weggis, a sleepy little lakeside town at its foot. Cable car was the only way of getting up and down, and it provided us with these absolutely breathtaking views. On our second and last (full) day in Switzerland, we went up to the summit of the mountain in the afternoon, and then down to Weggis later on in the day. There wasn't a whole lot to do at the top of the mountain, other than gaze at the jaw-dropping scenery and have a hearty feed of chips (all that fresh air gives you an immense appetite). And then we proceeded down to Weggis, pronounced "Vegas," ironically enough, as it could not have been sleepier. The streets were strangely devoid of people (apart from a handful at this super-incongruous "Latino" festival by the lakeshore), but what the town lacked in humans it made up for in kitschy garden ornaments. Seriously, every garden in the place had a fine display of colourful, creepy statuary. While the day had started off beautifully, all blue skies and fluffy white clouds, the heavens had taken an ominous turn by the time we got down to Weggis and we were caught in a sudden, torrential downpour. We dashed around the town frantically looking for shelter and eventually found respite in a little lakeside tea-room, where we consoled ourselves with sweet treats under the shelter of an awning while watching the rain lash down on the lake. But we made it back in one piece, thank God! And no sooner had we stepped off it then the hail stopped, the sun came out, and all was right again. Ah, Swiss weather, how fickle you are! We'd never been more soaked to the bone in our lives but even that didn't detract from our fond memories of this beautiful alpine country. We'll be back! Woow Nice journey, When Did you went? Have you went any more? ?